I find the path one step at a time. The way forward is imagined but ultimately unknown until my leg extends and I place the sole of my foot on the ground before me. From this new vantage point, my eyes scan the ground below and the terrain beyond. My ears discern movement from that which goes unseen but whose presence can impact my next move. Away from home during this sabbatical year, we are living Advent in an unknown land. The way forward it not known until we extend our legs and find our footing. Where do the Christmas decorations go in this rental house? How do we still feel the Advent rhythms away from our church’s rituals? How do we practice Advent in our small congregation of 5? Who is this newest little one among us? What will he bring to our family? When will his nighttime hours extend? How long can my sanity last on just accumulated sleep? When will strength replace weakness within this body of mine? What is this world we live in? Will we even recognize this country of ours after January 20? Where is the rescue to come from for the people of Aleppo, for immigrants, for racial discrimination, for journalists, for our environment, for our souls? In the morning, I ponder it all. The daily tasks await completion. Yesterday’s tasks were hurriedly accomplished, but not finished. The past lingers while the present demands. My mind struggles to hold it all in balance. And yet the future continues to be there – untouched by my attempts to control and out of reach from the past’s long reach. Christmas is days away and I cannot yet touch it. around which we dance and rejoice. “Prayers of the people” that I wrote for last Sunday’s service – words I share so that I might remember them for the times I wait for companionship, direction, or no one. Pushing the cart around Kroger at 5:00 p.m. and I think to myself – no one moves as fast as a mom squeezing in an errand before picking up the kids. Coffee filters. Eggs. Yogurts. The fuel that keeps this family running day to day. The next morning I find time FINALLY to sit down in the silence. The house is quiet. Yesterday has been cleaned up. Today is before me. Rushing, rushing, rushing… and then it’s there…alleluia. Standing in my closet, I frantically debate back and forth on the shoes before me. I first choose the bronze flats but soon reverse course. It’s a cold day and they won’t quite cut it. I place them back and pull out the red clogs. I think back to my college-self that wouldn’t be caught dead in the clogs. I place them on the ground and slip my feet in. I come downstairs and I remember who I am – one who is not defined by the choices I make in my closet. Rushing, rushing, rushing… and then it’s there… alleluia. Rounding the circle loop on the way to daycare, the sky shocks me out of my routine. 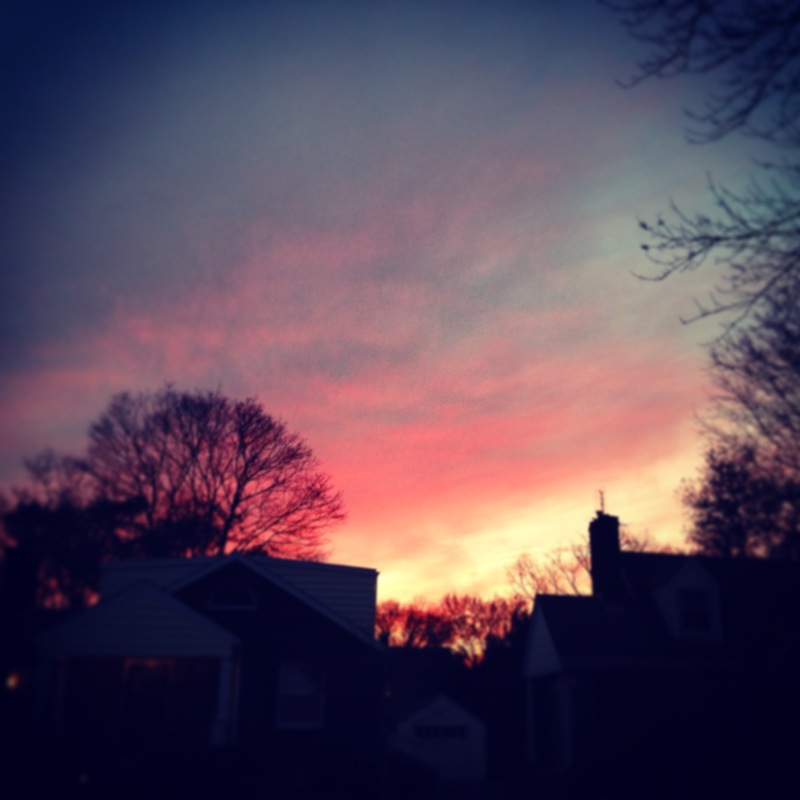 Pink has broken out and splattered across the sunset. As my hands shift on the steering wheel and I slow down to take it in, it seems radical and extravagant. It seems like a extravagant painting that is being wasted on a busy mom rushing to get boys picked up and home for dinner.